Props in presentations – useful tools or pointless gimmicks? From buckets to balls to brains, here are five presenters whose weird and wonderful props made their talks unforgettable. We’ve all heard of Bill Gates and his small act of mosquito liberation. But these speakers prove you don't have to terrify the audience to get your point across. I’ve already written about why Tom Savage’s TedxBristol talk is so great, and his sense of humour is a big part of it. The bucket provides a unifying theme for Savage’s talk, while the humour relaxes the audience and makes us more receptive to his ideas. Trying to describe an idea to a bunch of people with different fields of expertise and learning styles is tricky business. Andy Puddicombe makes the metaphor ‘juggling lots of balls’ literal, and it’s surprisingly effective at representing thought processes. It ensures that when we remember his talk we’ll see those balls spinning and be reminded to examine our thoughts. One by one, Amy Tan explores the things that are said to inspire creativity – abnormal brains, trauma, moral ambiguity, cosmic intervention – and whether they are applicable to her. She dismisses these to some extent, building our expectation and keeping us riveted until her muse is revealed – a tiny pooch! It makes perfect sense for a talk about the brain to feature a brain – but the audience’s shock and awe when Jill Bolte Taylor brings one onstage is audible. 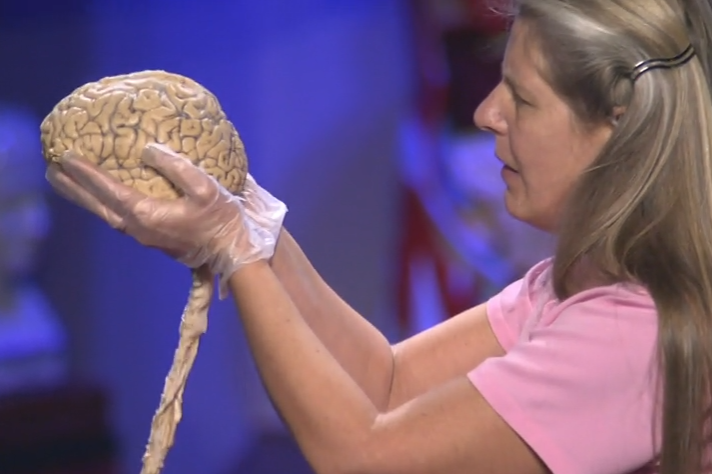 Most people in the audience won’t have seen a real human brain before, and this experience will have them talking about and sharing the experience for years to come. Dananjaya Hettiarachchi uses a rose as a symbol for the beauty and uniqueness in every individual person. Tearing apart the rose demonstrates what is done to us emotionally in times of adversity, and synchronises the emotions of the audience in empathy. When the rose is resurrected we feel hopeful, and Hettiarachchi’s message is made much more potent. Ultimately, using a prop is about visually anchoring your ideas – making them solid in your audience’s minds. It’s about providing something memorable, something interesting that they can talk about and help spread the word. If you can't think up the perfect prop – don't force it. But if you can, you might find that it adds layers of depth to your presentation that would be impossible otherwise.